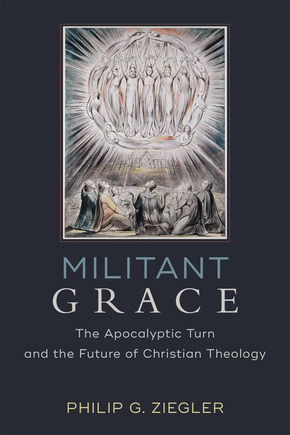 Philip Ziegler's Militant Grace is an introduction to one of the most important Protestant theological trends of the last decade or so. For the first time ever, we have a succinct and accessible explanation regarding the historical origins and the theological significace of the contemporary fascination with apocalyptic in Protestant theology. I briefly teased the apocalyptic trend in theology with my review of Doug Campbell's Paul. In short, Karl Barth's Romans commentary ushered in a new era of Pauline studies that was more in tune with the eschatological dimensions of Paul's gospel. In particular, the crucifixion is an apocalyptic moment (apocalypse means "unveil" or "reveal") whereby God's future for creation breaks into the old creation. The discontinuity between the old and new creations, the old and new humanity especially, are central to Paul's understanding of the Christian life. After Barth, this theme was developed further by Ernst Käsemann and J. Louis Martyn in the area of Pauline scholarship. Today some of its strongest proponents are Paul scholars like Doug Campbell and Beverly Gaventa. I first encountered this way of reading Paul in Doug Campbell's Intro to NT class at Duke. He introduced me to Doug Harinck's Paul Among the Postliberals and I became convinced that there were very important lessons for contemporary theology in this movement in NT studies. With Käsemann and Paul Lehmann, the theological implications of this Pauline trend were already under exploration. That exploration has continued with working groups at academic conferences and journal articles in a number of respected theological journals. Ziegler's book represents the next major step forward for the movement (if it can be called that) to the extent that it establishes a baseline that scholars can study, collaborate with, or criticize. An apocalyptic reading of scripture can account for "full scope, depth, and radically of the gospel of God" and help us to make sense of the jarring difference between the world the gospel foretells and the world we actually inhabit. Apocalyptic will be deeply christocentric from the start, emphasizing God's revelation in Jesus Christ as the central eschatological act of redemption. Apocalyptic will stress the tension experienced in the Christian life between the new creation rendered by God's saving work and the old creation. Apocalyptic will take seriously the biblical imagery of God in battle with the forces of evil for the salvation of humankind. The Church exists temporally to nurture and support the militant discipleship that Christians must maintain as thy join the battle against sin and death as God saves the world from evil. Christians are called to pray with expectation for the future that has already been revealed in Jesus's own victory over death at the cross. These theses set the tone for the rest of the work. Part 2 develops a number of these claims with specific reference to how an apocalyptic Christology informs other theological loci, particularly pneumatology and eschatology. Part 3 then focuses specifically on the question of discipleship, exploring questions of sanctification and obedience in conversation with John Calvin, Søren Kierkegaard, and Dietrich Bonhoeffer. Every chapter of the book was originally an independent essay. Nevertheless they are arranged here in a manner that develops Ziegler's overall theological vision in a step-by-step manner such that their revision and ordering here makes the sum of Militant Grace greater than its individual parts. Ziegler's account of apocalyptic is deeply conversant with Lutheran and Reformed thinkers, emphasizing that at the end of the day Apocalyptic might just be another name for radical Protestantism. In that case, its origins in Pauline studies makes sense. In particular, I'm drawn to Ziegler's location of divine sovereignty in the Kingship of Christ (Chs. 3 and 4), and his explorations of the relationship of the law to the gospel in apocalyptic (Chs. 8 and 9; esp. 9 as a strong critique of natural law as a viable Reformed concept). These are chapters that I intend to revisit a few times in the coming year. Review: Must-read for any serious student of Protestant Theology.